Marine and Antarctic studies attracts those who already have a fascination with the marine world or Antarctica, and are interested in becoming highly trained professionals able to contribute to understanding, managing and conserving the marine environment. If you enjoy the natural and physical sciences, you can combine your passion for science with a love of the outdoors and adventure. Practical classes and field trips provide extra challenges and opportunities to work alongside world-class academics and researchers. We combine these experiences with theoretical studies to broaden your experience and give you an edge when it comes to employment. Taught by world-renowned experts, this degree gives you a broad foundation in the study of temperate marine, Antarctic and Southern Ocean science based on interdisciplinary themes. In this degree you can choose your specialty: follow a research-oriented path at our Hobart campus, or focus on the more applied sciences in Launceston. We have five specialisations that cross the spectrum of these disciplines, which means that there really are options for everyone. Single degrees in Marine and Antarctic Science usually take three years to finish (full-time) and require the successful completion of 24 units. "Where else in the world could you study Antarctic studies and have the Antarctic research ship that later on could take you to the Antarctic to do your research? Its incredible!" I'm from the tropical island nation of the Maldives. I wanted to study something more than just marine science, so I decided to come to the University of Tasmania to study the Bachelor of Marine and Antarctic Studies. I researched a lot of universities. I compared the University of Tasmania with other universities and I found they provided a really unique course –the only marine and Antarctic science degree in the world. It also ticked all the boxes of what I wanted to study. So I said, "That's it, this is the degree, this is the uni! ", so I decided then and there to come to Tasmania. It is a great and rare opportunity to be able to study Marine Science and Antarctic Studies at the University of Tasmania. IMAS is one of the top research facilities in the world. In fact, I doubt there is any other university in the world that offers a world class facility like this to normal undergraduates to study Marine and Antarctic Science. *This course is no longer being offered through IMAS, however the University College has a new Associate Degree in Applied Science (Aquaculture) commencing in 2018. More information about the University College can be found here. Applications will automatically transfer and don't require you to reapply. The Associate Degree in Aquaculture offers student education and training in aquaculture and preparation for the workplace. This is achieved through a mix of vocational, scientific and technological activities together with work experience. The course emphasises the development of skills which lead to independence in the work place alongside the ability to work in a team situation. The Associate Degree in Aquaculture is a two year full-time (or part time equivalent) coursework program consisting of 16 X 12.5% weighted Units assessed by assignment and examination across Introductory (100 level) and Intermediate (200 level) Units. At IMAS we know that lots of high school students already have a passion for the marine environment. 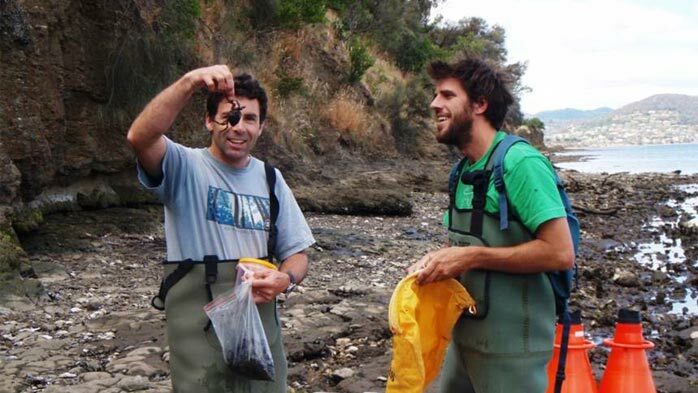 By enrolling in our XAS101 Practical Introduction to Marine Biology Year 11 and 12 students can experience a hands-on curriculum set in the beautiful Tasmanian marine environment.